Set in the picturesque surroundings of sparse deserts and dense forests, it is your task to strategically design and construct an engineering masterpiece. Watch in eager anticipation as unsuspecting motorists, heavy freight trains, and tourist riverboats approach. 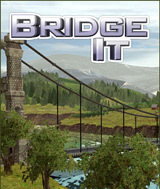 Will your solution stand up to the test or will tons of mangled steel be sent plummeting into the river below?